Poe Dameron - More Than A Pilot has sort of been lost in translation since the great days of his magnificent partnership with Rey2, the famed: R2P2. He did have a short moment with Cassian Andor before everyone fell in love with Jyn Erso2. Could it be that he has found a new home with Han Solo - Independent Hotshot? This deck was piloted by CloudCityCasuals to a top4 placement at the Fargo Regionals (North Dakota), the event that was eventually won by Andrew Rothermel's eVader3/Greedo. CloudCityCasauals did a great write-up of his match-ups on swdestinydb. Be sure to check that out as well! An alternative to this deck is the eBiggs/eHan/Fat Falcon deck (or the good ol' ePoe2/eCassian alternatively eJyn2/eCassian) which all plays out very similarly although looking completely different at glance. 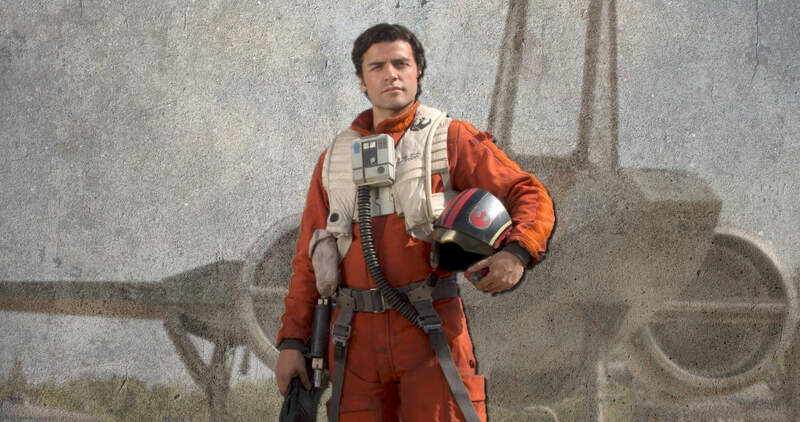 Poe Dameron and Han Solo are your archetypal middle-middle aggro pairing. They slot effortlessly together, sharing ranged damage sides and the possibility of some powerful Special chaining to boot. The only question is if the efficiency of the character team is simply too inefficient in a meta where decks can deal incredible amounts of damage in just a few turns. The average damage output from the pair should be somewhere in between 6-8 unmitigatable damage per round, and while that's decent, it requires good draws and above average rolls. That's already a pretty disturbing place to be. 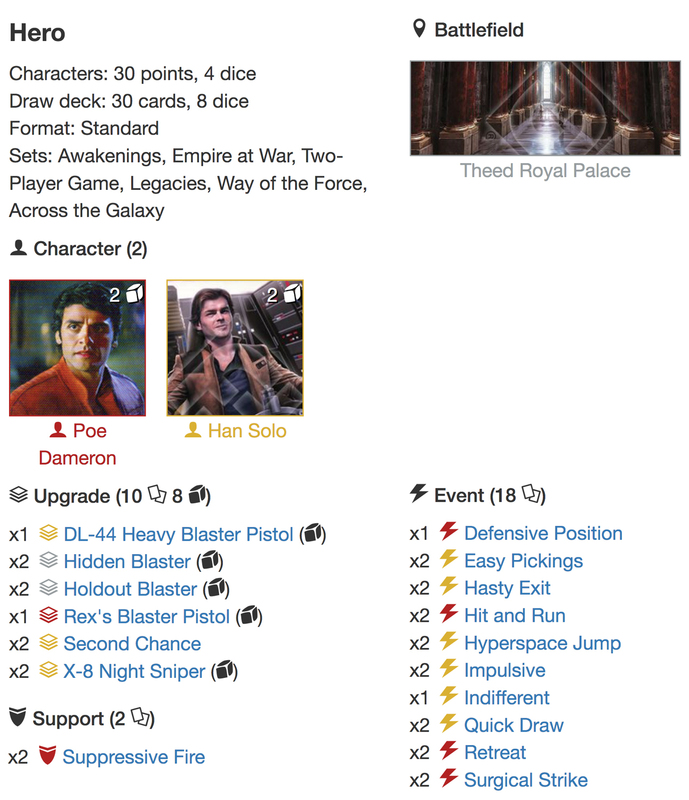 On the other hand, Poe's 2 Focus and Special sides does offer some consistency and works well together with Han's Special, arguably his best side, to set up those fast paced turns where you deal damage and get out with Hyperspace Jumps and Retreats. Your upgrade suite is literally THE COOKIE CUTTER upgrade package. You almost cannot go wrong with any of these as they have all proven their mettle in several high profile decks already. The only surprise omission from this list gotta be Poe Dameron's Blaster which is one of my absolute favourite guns on Poe. Your standard 2cost upgrades all have Ambush and are great in your starting hand. If you are losing the initiative roll-off the Hidden Blaster is best in case your opponent is silly and choose your Battlefield, which few will do because Theed Royal Palace is stupidly good, while the X-8 NIGHT SNIPER is a monster midgame and the HOLDOUT BLASTER good for the redeploy. Has Ambush and humongous damage sides, but does feel expensive at times especially if you need resources for mitigation and/or Hyperspace Jumps/Retreats (especially if you are not playing on Theed and just can't find those Specials for the life of you). It does give you pseudo-mitigation when playing it, but as you are the aggressor and often play guns before your opponent has dice in the pool, it doesn't feel that strong. This would probably be my candidate for switching with Poe's Blaster. Adding a Poe's Blaster would also give you more red ranged damage sides for your Surgical Strike. It has decent damage sides and the ability is great to flood the pool with dice! Played in conjunction with Hit And Run and something should die! 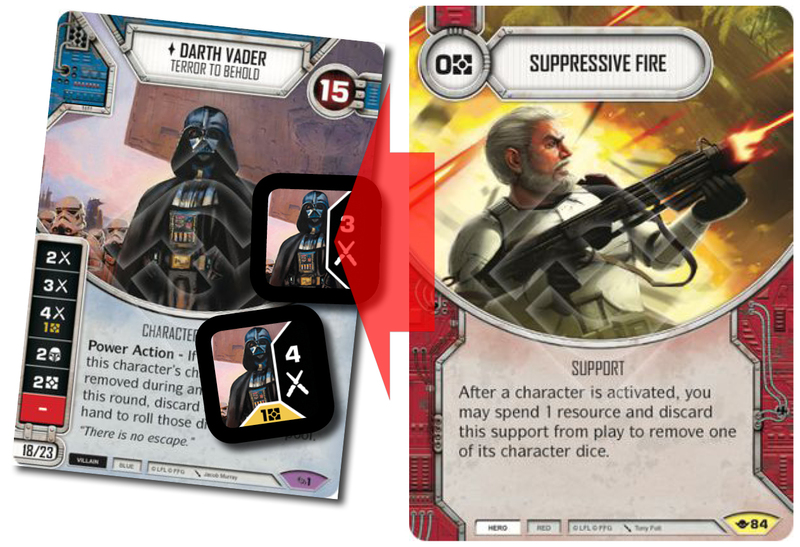 The meta is rife with eVader/Greedo decks at the moment and Suppressive Fire is one of the best way of getting rid of those pesky Vader dice bypassing the Power Action. 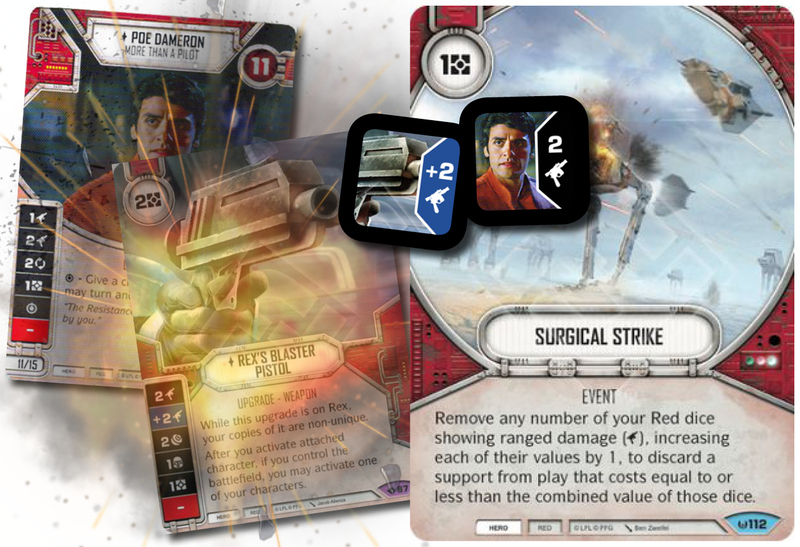 Don't get behind on the sequencing of Suppressive Fire, so get it into play when you can! 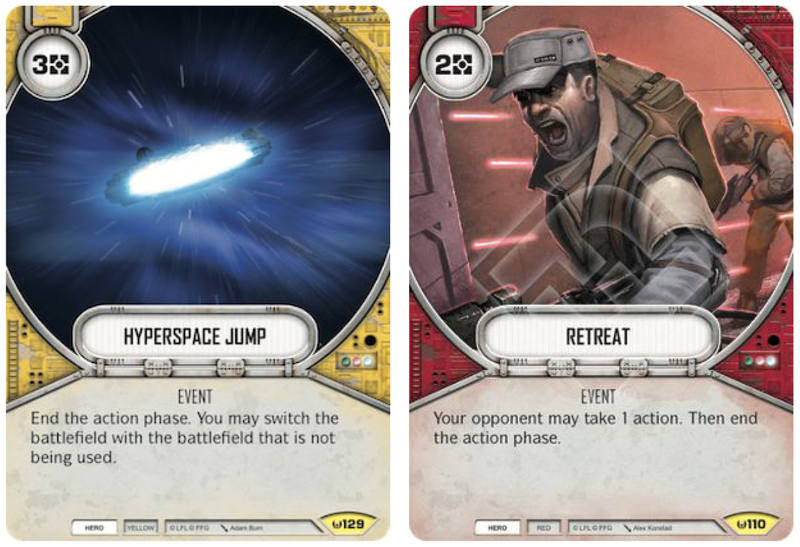 You are running a fairly small suite of removal cards: 6 cards, but add to this 2 Suppressive Fire, 2 Hyperspace Jump, 2 Retreat as well as 2 Second Chance and you are looking at 14 cards that will keep you alive. Killing something fast is often your best mitigation in this deck. DEFENSIVE POSITION can be absolute monster of a removal card, in particular because you'll be claiming out ahead of most decks, but against Special chaining decks, i.e. eYoda/eLeia3, it's almost useless. It's also highly susceptible to action cheating decks. EASY PICKINGS is still one of the best mitigation cards around although it feels somewhat weaker these days. 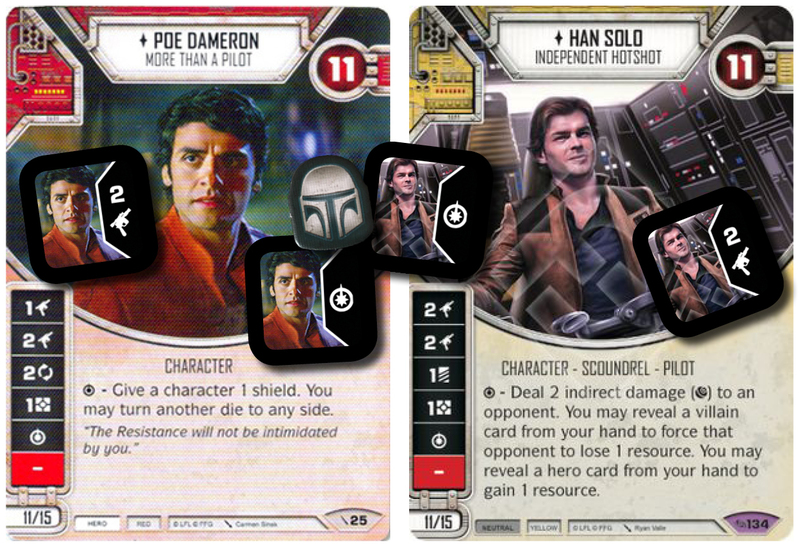 It does look like the prevalent character pairings and dice does not really favour Easy Pickings. It's still good, don't get me wrong, but there will be times where you feel that variance is constantly against you - and it's probably not. Great at removing damage dice and it's 0cost mitigation. It's value in this deck is augmented by the fact that you'll often want to end turns by Hyperspacing or Retreating, which means that your opponent should ideally speaking have limited time to setup, which in turn makes damage sides the most dangerous against you. There's a small weakness in the interaction between Hasty Exit and Defensive Position, which is worth keeping in mind. If you Hasty Exit, then Hyperspace Jump or Retreat, you are effectively turning off the Defensive Position because your opponent is now controlling the Battlefield! INDIFFERENT is great when you spot Han Solo, dead when he's dead. I'm still trying to figure out where to go with the mitigation suite, and although this looks right, there's probably still some way to go ... It's definitely the least obvious part of the deck. QUICKDRAW is functionally a pseudo HIT AND RUN, when used to play an Ambush weapon. Quickdraw is better in the first rounds and should be played over Hit And Run, and can be used on both characters, whereas Hit And Run is limited to Poe. Quickdraw an Ambush weapon on Han Solo, resolving a Special with Ambush can be an extremely potent start for this deck. It allows you to improve your boardstate and start accumulating resources for your "end turn cards" later. 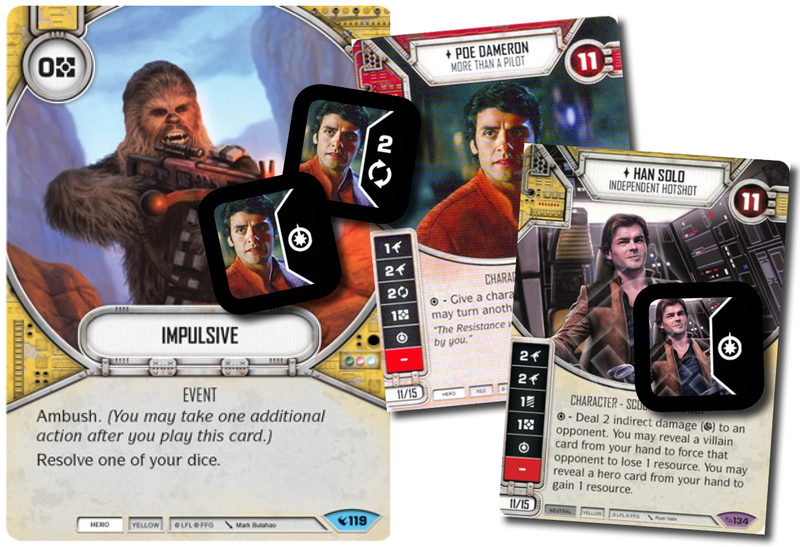 IMPULSIVE is also a "Speed card" and was one of my favourite cards with ePoe2/eHondo in the beginning of the Legacies meta. It is brilliant on the Poe 2 Focus side and also decent on a Poe Special. Remember, when you use Impulsive to resolve a Poe Special, it is NOT a part of the event to resolve other Specials, i.e. using Impulsive to resolve a Poe Special to give Poe a Shield and turn a Han die to a Special does not allow you to resolve the Han Special in the same action. 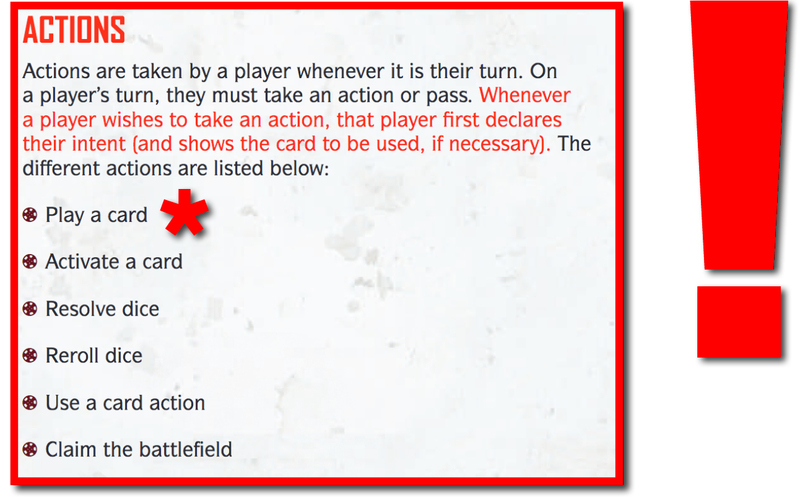 You can use the Ambush action to resolve dice though! Don't get caught in bad sequencing! SURGICAL STRIKE is excellent at combating the threat of vehicles, and is particularly good against FAT Vehicle decks. You basically just need two ranged damage sides to get rid of a Shadow Caster or a Firespray-31, which in either case is a game altering and most likely a game winning play. The main problem is the probability of hitting that. 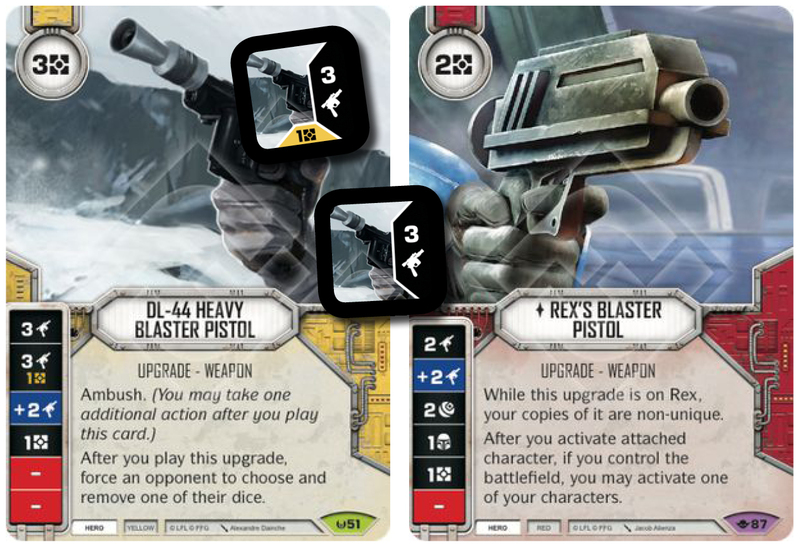 You are not endowed with 50% Ranged damage sides like Jyn Erso2, and you only have 1 upgrade that can help you out with Red ranged damage dice: Rex's Blaster Pistol. If you only have Poe's dice in play you are looking at just 4/36 = 11% chance of hitting enough Ranged damage to remove a 4cost upgrade! On top of this, all your dice that secures consistency, i.e. Focuses and Specials are Red dice, which means you lose them if you turn dice with them. This is another reason why I'm suggesting adding a Poe Dameron's Blaster ... and it's good! Your best tool go get ahead in the damage race is your "end turn cards", including HYPERSPACE JUMP and RETREAT. Dealing 6 damage and jumping is usually MUCH better than discarding to reroll and search for a couple more damage. You don't want to give your opponent any chance of building their boardstate. You constantly need to plan ahead for how to manage your resources to be able to both play upgrades and your "end turn cards". Even with 22hp across your two characters you do not want to get bogged down in a nasty shootout against a vehicle deck. That's a fight you'll be losing any day. It's often better to replace an upgrade, although you usually need 2 or more to consistently hit the damage you need, deal the damage and get out than take your chances of hitting a Special on Han to find additional resources. That Special though is soooo good! Be on the lookout for any possible Probes that can flush out your events! You already play quite a lot of cards from your hand, and it only takes a single discard to reroll for your key events to be in jeopardy! There might even be some merit to adding Friends in Low Places to the mix just to combat Probe. I like to see two 2cost weapons in my starting hand with the possibility of playing both IF I either have Theed and/or hit Resource/Specials. I always resolve resource sides if I get them in the first round. Early mitigation is important, then discard your hand to find Jumps and Retreats later. be warned though that Hasty Exit could be a dead card in round 1, although not many opponent's will choose your Battlefield (but you initiative roll-off is not particularly good) unless you find and play Rex's Blaster. Your match-ups will decide whether you need an early Surgical Strike as well. You'll know when. Ditch any Hit And Runs and Impulsive.